*below contains slight spoilers for Eve (Book #1)*What?! The thoughts my brain are trying to process are just "Why Anna why?" and "Where is Rise when I need it?". Honesty, Once is even better than Eve. It's more surprising, more gripping, and you get to uncover a whole new world as Eve discovers it. And one things for sure, Anna Carey loves to create gripping survival stories with heart breaking endings.It's been three months since Eve arrived in Califia and three months since she's seen Caleb. As much as she's told to forget, she knows in her heart she cannot. So, when she hears a rumor that Caleb is alive and in need of help, she takes that chance to escape. But, she quickly falls into a trap and is taken to the City of Sand. It's there that she uncovers her heritage... that she is the king's daughter. The world is still a corrupt place though, and Caleb is what matters most to her. Together they'll have to figure out a plan before Eve's new life turns even more upside down.At first, I admit I was nervous to read this one. With Eve ending in the all girls camp and no Caleb, I thought I was going to be disappointed but boy was I wrong. Anna took this series in a direction I wasn't anticipating at all and I thought Once was even more exciting than the first. All the new characters we got to meet I ended up liking for different reasons. Especially Charles, who is an artist in a way with a kind heart. And, even though Charles gets put into a tough place, I sympathized with him. Also, most of the book also takes place in the City Of Sand which was a nice change of scenery. It was exciting to see the town and all it's deceptions and beauty.For Caleb and Eve, I was extremely happy how their relationship progressed. I'm still in love with Caleb and his light green eyes and how he's willing to do anything for Eve. I feel so bad, so often for Caleb and I really want a happy ending so badly for him. He deserves it more than anyone. Then, there's Eve who everything and the kitchen sink is thrown at her in this story. She has to deal with the king being her father, lies, Caleb, new palace people, her friends, and everything in between and yet she handles them with her head on straight and major strength. Most characters, give into their new world or slightly do, but Eve hardly does and I was so proud of her. 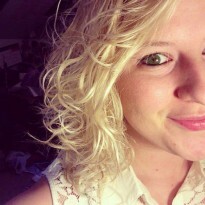 She saw the world around her, knew what she's been through, and stuck with perusing her same fight. High fives for Eve and Caleb all around! *sits here still shaking head* Anna, how can you make the book so fantastical, and then end it on a note like that? It's an ending where you're like what the hell just happened? And then you have to wait for the third book to hope you're wrong. 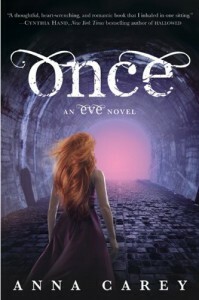 That being said, I was very impressed with Once and completely enjoyed it. I absolutely cannot wait for Rise.